Today was a bad day in the parenting world for me. Like really bad. Like a bad day that reduces you to tears and full on feelings of shame and not good enough. Everything today resulted in a meltdown. My shoes are too big. My shoes are too small. I don't want to wear socks. It feels funny without socks. BUT I DON'T WANT TO WEAR SOOOOOCKSSS! And, I wanted to eat here. Not here. I won't move. I will kick my legs if you try to pick me up. I will cry and wriggle while you carry me to the car. I will try to wiggle out of my car seat. I will kick the seat. It was a day that I lost my cool. I got so frustrated. I tried everything. I tried to reason. I tried to joke. I tried to lighten the mood. I tried bribing. I tried threats. I tried being mean mom. I had to walk away. I had to. I yelled. I shouted. I threatened. I pretty much did everything I said I would never do when I had kids. I pretty much did everything that if I was someone else watching, I would have said, "Wow, lady you really need to calm down." Or even worse, "She is a bad mom." Because don't we do that- cast our worse judgements on others when in fact, those are the very things we are most ashamed of, of ourselves? And after it all, after she fell asleep on the floor in the middle of her room, I went in, laid next to her and cried. I hate days like this. I hate thinking that she will remember this moment. Of the time mommy was so angry, yelling and standing over her. And that's when the shame roll kicks on. Thoughts of, "How could you have lost your cool? WHY did you completely lose it?" "You are a terrible mother, person, to lose it and not be able to keep it together." "What is wrong with you?" "I am not good enough." "I am failing." "I failed." 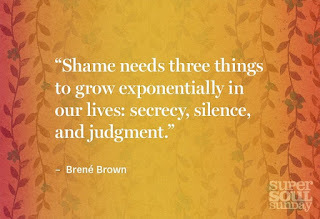 Shame is a big thing for me. It creeps up on me and then takes over like nothing else. It's something as humans we all experience. It controls my thoughts and paralyzes me. Shame tells me I'm not good enough. That I will never be good enough. Perfect enough. It tells me that I can't make mistakes as a parent, mother and if I do that makes me somehow less of a person. It's the SHOULD'S- you SHOULD be able to stay calm, you SHOULD have it all together, you SHOULD know what to do. SHOULD SHOULD SHOULD. It keeps ringing in my head and stays there. 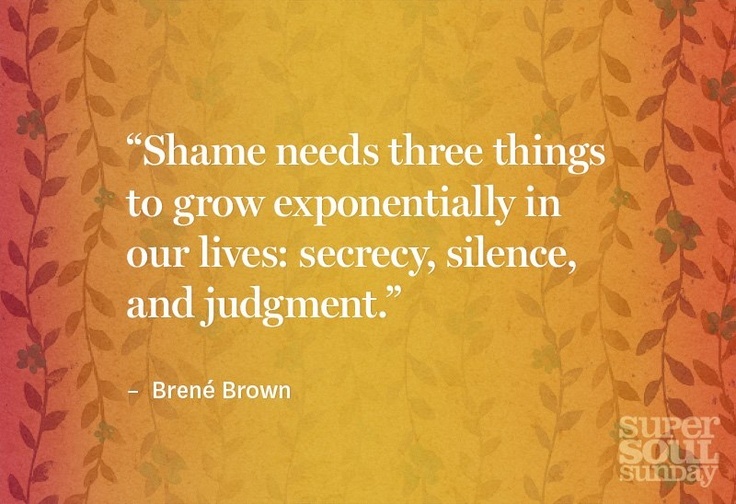 Shame isolates me. Shame makes me feel alone. Like I'm the only one who has ever lost it. Has ever yelled or lost her temper with her kids. I know shame lives on when we keep it hidden. When we try to keep it a secret. It thrives on secrecy. So, I am hopeful that by sharing this moment with all of you, not only can I own my experiences, but I can be real and move on. I know in my head- this was just a bad day. Could I have reacted more calmly? Oh yes, you bet. Could I have done things a little differently? Probably. But I am human. I have feelings. I am not perfect. And that's ok. It's ok. It's all gonna be ok and I am enough. And that's how I will slowly change the shame roll. I just got done reading "Gifts of Imperfection" by Brene Brown. I found myself nodding in agreement and understanding throughout the entire book. I strongly encourage you to read it. 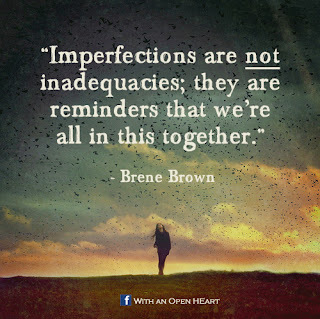 I also wrote a post about perfectionism that you can read here.